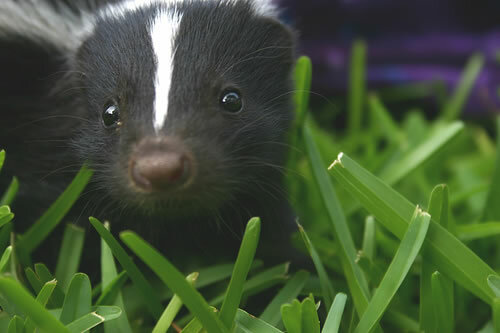 I saw 4-5 skunk carcasses per day on the roads in South Dakota. Thankfully I didn’t have anything to do with their deaths, other than just noticing their mangled little bodies. Since reading about frightened bunnies crossing the street in Watership Down, I loath seeing animals on the side of the road as it takes me into wondering what their last, innocent, terrified moments were like. I have been so grateful on this trip that I have avoided any wildlife under my wheels. EXTREMELY grateful. 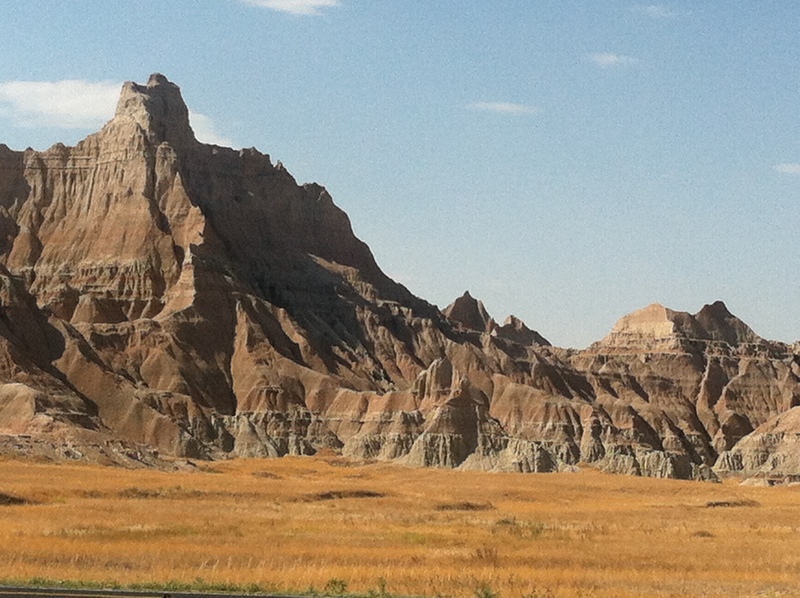 My plan of the day was to drive and hike in Badlands National Park. 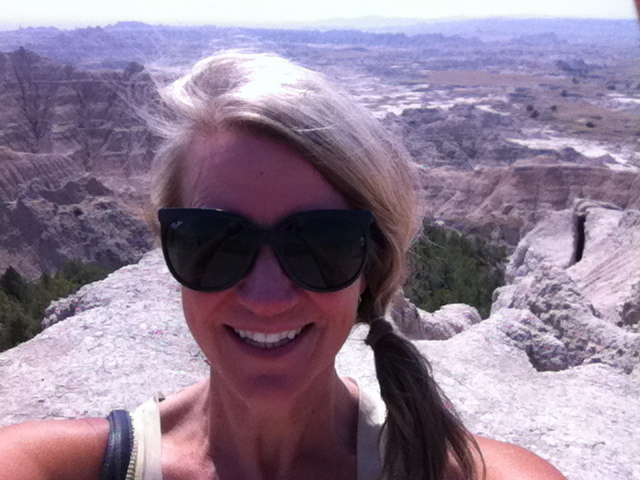 It had been recommended to me by a ranger in Bryce Canyon National Park over four months ago. Wow, to think that I have been on the road that long is rather mind-blowing. 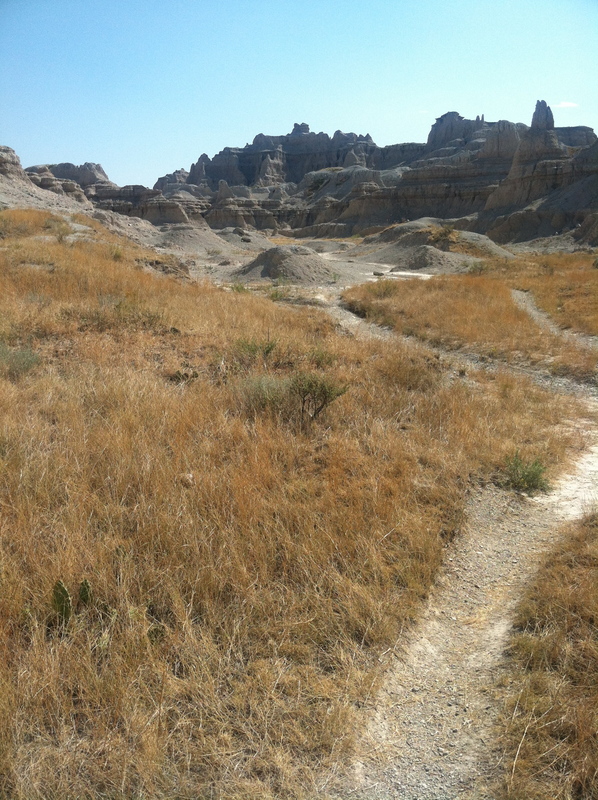 The temperature was around 103 degrees as I arrived in the park, so I was questioning the feasibility of the hiking. I had plenty of water, but still, the idea of wandering around alone in the dry, hot, desert landscape was losing its appeal. 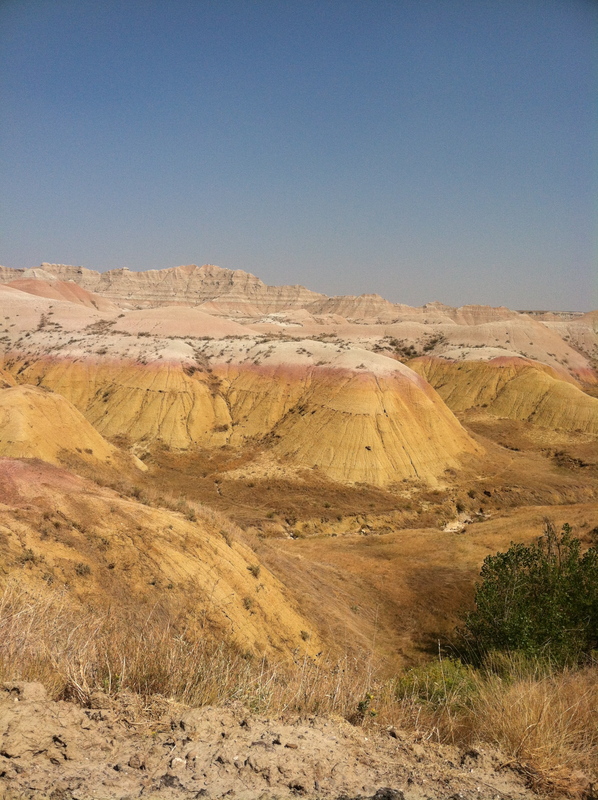 I took my time to stop at overlooks and snap photographs of areas that looked like a bunch of anthills on the moon, incredible beautifully colored domed hills, canyons with sharp shadows; it was a geological wonderland. I made a beeline to the visitor’s center to watch the nifty, informative film and learn about the geology for this wildly glorious place. It was at one time under water, so the colorful layers, uplift and sculpted canyons were formed as the water came and went. It is both vibrant and drab, but beautiful in silence and harshness. They recommend taking time to just sit and ponder, watching the world before you. I thought this a brilliant suggestion and wished I had planned more time in my schedule to do so. 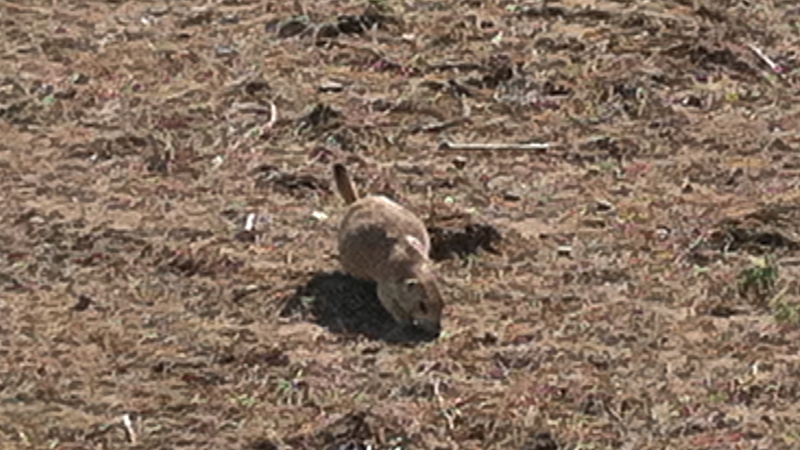 I saw large prairie dog towns and watched them popping in and out of their holes, their little legs cantering like horses. But other wildlife was hidden from my view. I basked in the silence and feeling of time standing still. I walked out into an area off the path and felt the immense stark loneliness and was loath to get out of eyesight of my vehicle. It was a strange cutting-of-the-tether experience to go around the corner from any sight of humanity. Unsettling. I would like to visit this area in the Spring and see if the rhythm changes when the temperature lowers and water is more abundant. For now all seems slow and heavy. I was caught up in the thick pace so didn’t venture far and was each time relieved to get back to my air-conditioned car. 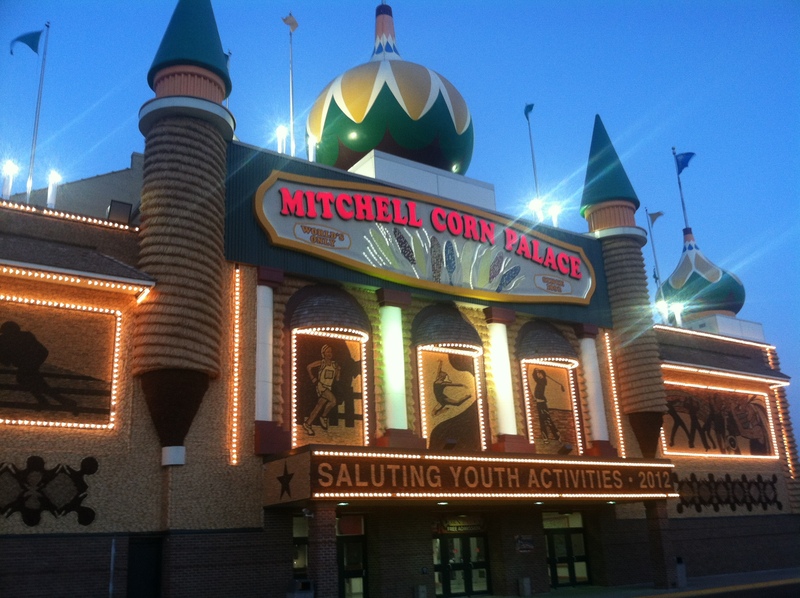 I drove another three hours to stop the night in Mitchell, SD, home of the famous Corn Palace. I quickly parked to take a look at the pictures made out of corn cobs cut in half and nailed into place on the outside of the building. 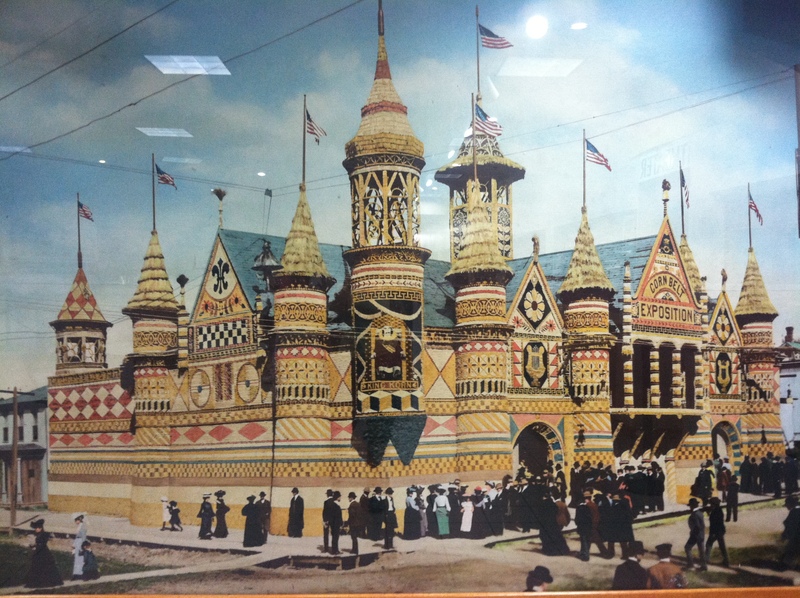 There was a progression of photos inside of the 100 years that this tradition has been continuing. The one I have posted here is one of the earliest renditions, and much more impressive than what is represented today. But they change it every year, designing new scenes using different shades of corn and native grasses to create quite an artistic spectacle. It was such a testament to ingenuity, creativity, and town pride to continue this tradition of honoring their agricultural roots. I was happy that I took the few minutes to explore it, even though I was exhausted and ready to be stationary for the night. They have made a name for themselves in the middle of no where and that is also what I am striving for, to celebrate my completely corny self.